Photos: Guy D'Alema/ABC; Paul Bishop/NBC; Craig Sjodin/ABC. Hump: If you want to read a great treatise on why Andi Dorfman, who chose to self-evict from The Bachelor after what ABC kept advertising as the “nightmare in the fantasy suite” went down in St. Lucia, check out what Annie Georgia Greenberg had to say about the episode. It’s all spot-on. True, we have to take reality shows of this ilk with a grain of salt (the whole Dead Sea's worth in some cases), but this week’s Bachelor was about so much more than blowing the lid off the ersatz, hyper-idealized, overly romanticized farce of supposedly real people searching for supposedly real love. On these shows, the contestants are thrown into extreme, fantastical situations that I’m pretty sure even Kate Middleton and Prince William’s courtship didn’t include — and they’re legit royalty. How can you suspend disbelief to watch "real" dates that include a farm-to-table meal in Vietnam or visiting the set of The Hobbit in New Zealand? Then, at the end of this magical gambol, two people who’ve spent mayyybe 24 hours together total are supposed to commit to getting married. Therein lies the problem with the illusion of fairytale love The Bachelor tries to project. You can’t really discuss how it’s important to you that your kids be bar mitzvahed when you’re cave-diving in front of cameras, with producers goading you to make out under a waterfall. Andi tried to use her fantasy-suite date to see if Juan Pablo actually wanted to know about who she is as a person, and if they would be compatible in the long run. He apparently used it to buy directly into the bullsh*t of the show. Maybe Andi was wrong in thinking she could go on a reality show and fall in love with someone she got to really and truly know in a few short weeks. Maybe Juan Pablo really thinks that’s what he’s been doing this entire time (and with multiple women). In the end, it went exactly as Annie says, though, and that’s why many people are using Andi’s experience to stand for something much larger. When she tried to confront Juan Pablo about her feelings, he just kept saying “It’s okay” to all of her points of contention. But it wasn’t okay, and the fact that a man ABC selected as worthy of having successful, beautiful, independent women vie for his affection thought it was caused the show to lose a lot of credibility for the brand of romance it tries so hard to sell. 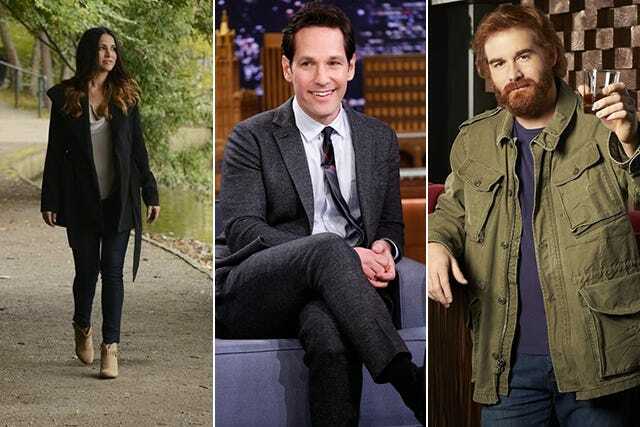 Marry: Last week — or really any date before this past Tuesday — if you’d asked me what one of my wildest fantasies would involve, I would’ve said, “Easy: Paul Rudd. Queen. Dancing. Lip-syncing.” There may have been some other stuff involved, but I won’t go into it here. Nevertheless, let’s just say the brilliant minds on the writing staff of The Tonight Show With Jimmy Fallon got ahold of my “Fantasy Folio” (not to be confused with my Dream Journal) and made so many of them come true. Please be more perfect and dreamy, Paul Rudd, seriously. And don’t stop him now, cause he’s having such a good time. He’s havin’ a ball — and I’m right there with him. Kill: Just going to keep a running list of things I “learned” from the premiere of ABC’s newest sitcom named after a trend piece from The New York Times circa 1999, Mixology. I’m trying to come up with something — maybe The Dumpster? The Groda (grody Yoda)? The Grubber? The Blumberjack? Please add your suggestions in the comments.